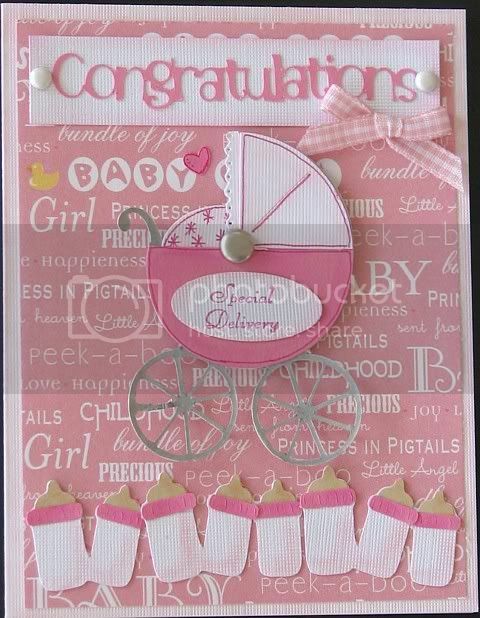 Here is a card that I made for a neighbor's baby shower. It was a whole lot of fun. I used the New Arrival cartridge on my cricut machine by Provo Craft. It is the most used tool in my scrapbooking room. I just love to paper craft. I started out scrapbooking, and then I got into card making, too. I think that they go hand in hand.....you have all the supplies for both, why not do both?? Very very very cute card!!! just love it, have any ideas for a baby boy?